The Events API is a streamlined, easy way to build apps and bots that respond to activities in Slack. All you need is a Slack app and a secure place for us to send your events. Tell us where to send your carefully selected event types and we'll deliver them with grace, security, and respect. We'll even retry when things don't work out. Subscribe to the event types you want and don't worry about the events you don't need. The event types sent to you are directly tied to the OAuth permission scopes awarded as users install your Slack App. Slack Apps including bot users can subscribe to events related to the channels and direct message conversations they are party to. Build bots without a bothersome bevy of RTM API websockets. Find the right mix of user-based and bot user-based event subscriptions for your needs. Use both the Events and RTM APIs together for more redundancy and concern separation. Choose the technical implementation that's right for you. Members send messages in a channel the bot belongs to. The messages are about lots of things, but some of them contain today's secret word. Your server receives a message.channels event, as per its bot subscription and membership in #random. Your server responds with a swift and confident HTTP 200 OK. Your bot is trained to listen for today's secret word, and having found it, decides to send a message to the channel, encouraging everyone to keep that word secret. Your server uses chat.postMessage from the Web API to post that message to #random. Using the Web API with the Events API empowers your app or bot to do much more than just listen and reply to messages. For many, the Events API is drastically simpler to integrate with than the real time messaging API. If you're already familiar with HTTP and comfortable maintaining your own server, handling the request and response cycle of the Events API should be old hat. If the world of web APIs is new to you, the Events API is a great next step after mastering incoming webhooks or the Web API. Is the Events API right for your app? Before starting, you may want to make a few early decisions about your application architecture and approach to consuming events. One way to use the Events API is as an alternative to opening websocket connections to the real time messaging API. Instead of maintaining one or more long-lived connections for each workspace an application is connected to, you simply set up one or more endpoints on your own servers to receive events atomically in near real-time. Some developers may want to use the Events API as a kind of redundancy for their existing websocket connections. And other developers will use the Events API to receive information around the workspaces and users they are acting on behalf, to improve their slash commands, bot users, notifications, or other capabilities. With app events, you can track app uninstallation, token revocation, Enterprise Grid migration, and more. The Events API leverages Slack's existing object-driven OAuth scope system to control access to events. For example, if your app has access to files through the files:read scope, you can choose to subscribe to any or none of the file-related events like file_created and file_deleted. You will only receive events that users who've authorized your app can "see" on their workspace (that is, if a user authorizes access to private channel history, you'll only see the activity in private channels they are a member of, not all private channels across the workspace). Bot users may also subscribe to events on their own behalf. The bot scope requested when workspaces install your bot covers events access for both the Events API and the Real Time Messaging API. To begin working with the Events API, you'll need to create a Slack app if you haven't already. While managing your application, find the "Event Subscriptions" configuration page and use the toggle to turn it on. After a little more configuration, you'll be able to select all the event types you want to subscribe to. They all receive a HTTP POST containing data in response to activity. In the Events API, your Events API Request URL is the target location where all the events your application is subscribed to will be delivered, regardless of the workspace or event type. Since your application will have only one Events Request URL, you'll need to do any additional dispatch or routing server-side after receiving event data. Your Request URL will receive JSON-based payloads containing wrapped event types. The volume of events will vary depending on the events you subscribe to, and the size and activity of the workspaces that install your application. Your Request URL might receive many events and requests. Consider decoupling your ingestion of events from the processing and reaction to them. Review the section on rate limiting to better understand the maximum event volume you may receive. Your Event Request URL must be confirmed before saving this form. If your server takes some time to "wake up" and your initial attempt at URL verification fails due to a timeout, use the retry button to attempt verification again. The events sent to your Request URL may contain sensitive information associated with the workspaces having approved your Slack app. To ensure that events are being delivered to a server under your direct control, we must verify your ownership by issuing you a challenge request. token — This deprecated verification token is proof that the request is coming from Slack on behalf of your application. You'll find this value in the "App Credentials" section of your app's application management interface. Verifying this value is more important when working with real events after this verification sequence has been completed. When responding to real events, always use the more secure signing secret process to verify Slack requests' authenticity. challenge — a randomly generated string produced by Slack. The point of this little game of cat and mouse is that you're going to respond to this request with a response body containing this value. type — this payload is similarly formatted to other event types you'll encounter in the Events API. To help you differentiate url verification requests form other event types, we inform you that this is of the url_verification variety. Careful, response URLs are case sensitive. Once you receive the event, complete the sequence by responding with HTTP 200 and the challenge attribute value. Once URL verification is complete, you'll see a green check mark celebrating your victory. If you receive an error from your server, a timeout, or other exceptional condition occurs, you'll see error messages that will hopefully help you understand what's amiss before you retry once ready. With this challenging handshake complete, you're ready to open up our event type catalog and decide which events to subscribe to. After configuring and validating your Request URL, it's time to subscribe to the event types you find fascinating, useful, or necessary. Team Events - these are the events that require a corresponding OAuth scope, and are perspectival to a member installing your application. Bot Events - subscribe to events on behalf of your application's bot user, no additional scopes beyond bot required. As with workspace Events, you'll only receive events perspectival to your bot user. 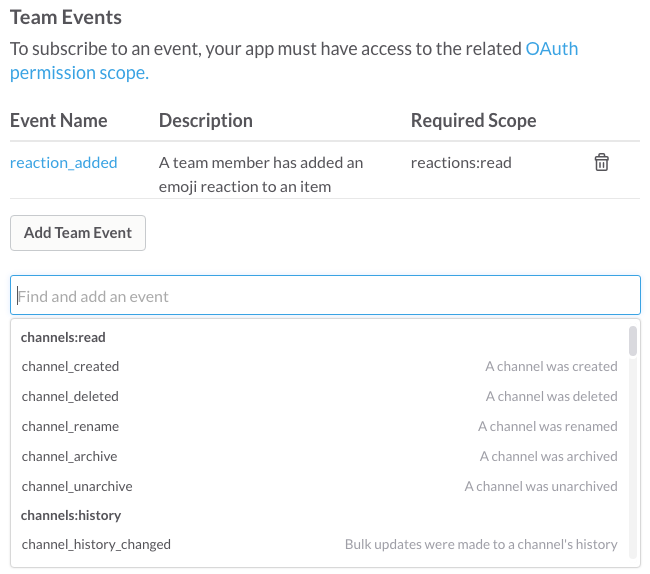 The Events API is backed by the same OAuth permission scoping system powering your Slack App. If workspaces have already installed your application, your Request URL will soon begin receiving your configured event subscriptions. For any workspaces that have yet to install your application, you'll need to request the specific OAuth scopes corresponding to the event types you're subscribing to. If you're working on behalf of a bot user, you'll need your bot installed the typical way, using the bot OAuth scope. Authorize users for your Event Consumer app through the standard OAuth flow. Be sure to include all of the necessary scopes for the events your app wants to receive. Consult our index of the available event types with corresponding OAuth scopes. With all this due preparation out of the way, it's time to receive and handle all those event subscriptions. Your Request URL will receive a request for each event matching your subscriptions. One request, one event. You may want to consider the number of workspaces you serve, the number of users on those workspaces, and their volume of messages and other activity to evaluate how many requests your Request URL may receive and scale accordingly. The token, team, and api_app_id fields help you identify the validity, origin, and destination of the request. The event attribute contains a JSON hash for the corresponding event type. The event wrapper is an event envelope of sorts, and the event field represents the contents of that envelope. Learn more — much more — about the event wrapper, including its JSON schema. Also referred to as the "outer event", or the JSON object containing the event that happened itself. token String The shared-private callback token that authenticates this callback to the application as having come from Slack. Match this against what you were given when the subscription was created. If it does not match, do not process the event and discard it. team_id String The unique identifier for the workspace/team where this event occurred. api_app_id String The unique identifier for the application this event is intended for. Your application's ID can be found in the URL of the your application console. If your Request URL manages multiple applications, use this field along with the token field to validate and route incoming requests. event Event Type Contains the inner set of fields representing the event that's happening. authed_users Array An array of string-based User IDs. Each member of the collection represents a user that has installed your application/bot and indicates the described event would be visible to those users. You'll receive a single event for a piece of data intended for multiple users in a workspace, rather than a message per user. The structure of event types vary from type to type, depending on the kind of action or object type they represent. If you're already familiar with the real time messaging API, you'll find that the inner event structure is identical to corresponding events, but they are wrapped in a kind of event envelope in the callbacks we send to your Event Request URL. type String The specific name of the event described by its adjacent fields. This field is included with every inner event type. event_ts String The timestamp of the event. The combination of event_ts, team_id, user_id, or channel_id is intended to be unique. This field is included with every inner event type. "Time is the moving image of eternity" — Plato. user String The user ID belonging to the user that incited this action. Not included in all events as not all events are controlled by users. See the top-level callback object's authed_users if you need to calculate event visibility by user. ts String The timestamp of what the event describes, which may occur slightly prior to the event being dispatched as described by event_ts. The combination of ts, team_id, user_id, or channel_id is intended to be unique. item String Data specific to the underlying object type being described. Often you'll encounter abbreviated versions of full objects. For instance, when file objects are referenced, only the file's ID is presented. See each individual event type for more detail. If multiple users on one workspace have installed your app and can "see" the same event, we will send one event and include a list of users to whom this event is "visible" in the authed_users field. For example, if a file was uploaded to a channel that two of your authorized users were party to, we would stream the file_uploaded event once and indicate both of those users in the authed_users array. Your app should respond to the event request with an HTTP 2xx within three seconds. If it does not, we'll consider the event delivery attempt failed. After a failure, we'll retry three times, backing off exponentially. Maintain a response success rate of at least 5% of events per 60 minutes to prevent automatic disabling. Respond to events with a HTTP 200 OK as soon as you can. Avoid actually processing and reacting to events within the same process. Implement a queue to handle inbound events after they are received. What you do with events depends on what your application or service does. Maybe it'll trigger you to send a message using chat.postMessage. Maybe you'll update a leaderboard. Maybe you'll update a piece of data you're storing. Maybe you'll change the world or just decide to do nothing at all. We don't want to flood your servers with events it can't handle. Event deliveries currently max out at 30,000 per workspace per 60 minutes. If your app would receive more than one workspace's 30,000 events in a 60 minute window, you'll receive app_rate_limited events describing the conditions every minute. When rate limited, your Request URL will receive a special app event, app_rate_limited. minute_rate_limited - a rounded epoch time value indicating the minute your application became rate limited for this workspace. 1518467820 is at 2018-02-12 20:37:00 UTC. You'll receive these callbacks for each of the minutes you are rate limited for that workspace. As Slack sends your request URL events, we ask that you return a HTTP 200 OK for each event you successfully receive. You may respond with a HTTP 301 or 302 and we'll follow up to two redirects in our quest for you to provide us a HTTP 200 success code. Respond with success conditions to at least 5% of the events delivered to your app or risk being temporarily disabled. Once you've repaired your ability to handle events, re-enable subscriptions by visiting Slack app management, selecting your app, and following the prompts. You'll need to go to Live App Settings if your app is part of the directory. While we limit the number of failure conditions we'll tolerate over time, we also gracefully retry sending your events according to an exponential backoff strategy. With each retry attempt, you'll also be given a X-Slack-Retry-Num HTTP header indicating the attempt number: 1, 2, or 3. Retries count against the failure limits mentioned below. too_many_redirects - We'll follow you down the rabbit hole of HTTP redirects only so far. If we encounter more than 2, we'll retry the request in hopes it won't be that many this time. ssl_error - we couldn't verify the veracity of your SSL certificate. Find tips on producing valid SSL certificates here. http_error - we encountered an HTTP status code that was not in the HTTP 200 OK range. Maybe the request was forbidden. Or you rate limited us. Or the document just could not be found. So we're trying again in case that's all rectified now. unknown_error - we didn't anticipate this condition arising but prepared for it nonetheless. For some reason it didn't work and we don't know why yet. If your server is having trouble handling our requests or you'd rather we not retry failed deliveries, provide a HTTP header in your responses indicating that you'd prefer no further attempts. By presenting this header, We'll understand it to mean you'd rather this specific event not be redelivered. Other event deliveries will remain unaffected. If you're responding with errors, we won't keep sending events to your servers forever. When your application enters any combination of these failure conditions for more than 95% of delivery attempts within 60 minutes, your application's event subscriptions will be temporarily disabled. We'll also send you, the Slack app's creator and owner, an email alerting you to the situation. You'll have the opportunity to re-enable deliveries when you're ready. Manually re-enable event subscriptions by visiting your application's settings. If your app is part of the directory, use your Live App Settings instead of your development app. Inevitably, the status of your subscriptions will change. New workspaces will sign up for your application. Installing users may leave a workspace. Maybe you make some tweaks to your subscriptions or incite users to request a different set of OAuth scopes. When a user installs your app, you'll immediately begin receiving events for them based on your subscription. Your application's granted OAuth scopes dictate which events in your subscription you receive. If you've configured your subscription to receive reaction_added, reaction_removed, and file_created events, you won't receive all three unless you request the reactions:read and files:read scopes from the user. For example, If you'd only requested files:read, you'll only receive file_created events and not reaction_added or reaction_removed. If a user uninstalls your app (or the tokens issued to your app are revoked), events for that user will immediately stop being sent to your app. If you modify your subscription through the application management interface, the modifications will immediately take effect. For example, you've been requesting files:read from users and decide to add the file_created event. Because you already have access to this resource (files), you'll begin receiving file_created events as soon as you update your subscription. For example, you've been requesting channels:read from users and decide to add the file_created event. Because you don't have access to this resource (files), you won't receive file_created events immediately. You must send your existing users through the OAuth flow again, requesting the files:read scope. You'll begin to receive file_created events for each user after they authorize files:read for your app. Events will immediately stop being sent for all users who have installed your app. Their OAuth scopes and authorizations will not be affected. If you weren't granted the permission scopes for the removed event subscription, then nothing really changes. You weren't receiving those events anyway and you won't be receiving them now either. To toggle your bot user's presence when connected exclusively to the Events API, visit your app management console's Bot Users tab. Learn more about the nuances of bot user presence. If you want to bookmark that handy list, do so here. Want to browse the list of events and even some of their properties programmatically? Check out our AsyncAPI spec for the Events API. Your application has a life of its own. You built it, you cultivate it, you maintain and improve it. But still, stuff happens to your app in the wild — tokens get revoked, workspaces "accidentally" uninstall it, and sometimes teams grow up and become part of a massive Enterprise Grid. Sophisticated apps want to know what's happening, to situationally respond, tidy up data messes, pause and resume activity, or to help you contemplate the many-folded nuances of building invaluable social software. Your app is interesting, wouldn't you like to subscribe to its newsletter? Subscriptions to App Events require no special OAuth scopes — just subscribe to the events you're interested in below and you'll receive them as appropriate for each workspace your app is installed on. Operational detail for each event is available in its respective documentation. Why choose the Events API over the RTM API? Find out why to choose one or the other (or both!) in the Events API FAQ. Tolerate minor changes in event type and object type structures. Expect additional fields you haven't encountered before and fields that are only conditionally present. Bot users using the Events API exclusively must toggle their presence status using their app management console. The Events API is best used in conjunction with other platform features. In particular, to send messages as a bot user or on behalf of your application, use chat.postMessage. Handle anything else your app does by using incoming webhooks and other write-based web API methods. De-couple your ingestion of events from processing and reacting to them. Especially when working with large workspaces, many workspaces, or subscribing to a large number of events. Quickly respond to events with HTTP 200 and add them to a queue before doing amazing things with them. Some event types are not available in bot user subscriptions. Consult an event's documentation page for information on whether that event is supported for bot users. Some event types are less likely to happen than others. Events like message.channels happen frequently on typical workspaces. im_history_changed on the other hand is a rare occurrence on even the busiest of workspaces. Building an integration for Enterprise Grid workspaces? Consult the Enterprise Grid docs for notes on Events API usage and shared channels.